There are 3 peaks to a completed wave count. A reversal of trend takes place after a completed wave count. Often times it’s as simple as counting 3 bumps on a chart . . . Other times, not so easy. In a downtrend the same rules apply except you are counting 3 valleys instead of 3 peaks. Each step must stay confined to a channel. Laying a pen or pencil on the chart will help you visualize the channel. As the trend progresses, all of the steps that make up the overall current trend will also be confined to a larger channel. When the market breaks a channel (regardless of the perceived wave count), the current step has been terminated. Sometimes I will use the terms step and wave interchangeably, but usually a wave is considered to be larger than a step. Wave Counts In Charts – Numbers of the same color represent steps within the same wave. For instance, red 1, red 2 and red 3 are steps within the same wave. Different colored numbers represent steps in totally separate waves. For instance, a red 1 occurs in one wave while a blue 1 occurs in a totally separate wave (refer to charts for examples). Reading the glossary helps a great deal in the understanding of this blog. This link has my charts, which are always current and constantly updated during market trading. They don’t lag market trading by 15 minutes which is true of many charts. There are 9 pages of index charts. Each page consists of (1) the same stock market indexes, and (2) the same time frame. The time represented by each vertical bar is the same on each page but increases in length on each succeeding page. The vertical bars on the 9 pages ranges from 1 minute to 1 month. The final pages of these charts consists of growth stocks. These are stocks that have constantly risen in price since 1990. One qualification is that they must not be severely damaged in a bear market so they can’t rise to significant new highs in the following bull market. The growth stocks show daily market action for the last 3 years and weekly prices since 1990. This gives a good perspective to how they have behaved in the immediate past (daily charts) and how they behaved during good and bad times (weekly charts). Hopefully things will continue to return to normal around here with no more breaks in the publishing routine (fingers are crossed). As suspected, the FED is out of bullets and the market doesn’t like it. The initial reaction to the FED news was negative, falling 160 points in 10 minutes. It then rallied back 100 points over the next 45 minutes. After that the market had had enough time to digest the FED statement and decided it was really unhappy and promptly fell 230 points in the last 45 minutes of trading. I would say it’s conclusive that the market wasn’t pleased with the FED. With the FED out of firepower, the ball pops back into Congress’ lap. But it seems doubtful that the republicans are going to do anything to manage the economy because we are in the silly season commonly known as the election of the next president. The republicans are using the cry of “It’s the deficit stupid!” Just like Clinton in 1992, “It’s the economy stupid!! !” It was effective then and it might be effective this time too. But without a shot of bliss from Congress, it’s a game of roulette, where the ball stops, nobody knows. The funny thing about the republican stance against aiding the economy with certain programs, the next president in 2013 (republican) will ask for many of the same items that will be refused today. Yup, it’s the silly season. My viewpoint is that all efforts in the long run will be futile, we will go where we have been headed since the year 2000, to hell in a hand basket as mother always said. It’s always been a question of when do we get there, not if we get there. The only surprise for me is that we might go there immediately instead of waiting a couple of more years. If you made me pick an outcome I believe this too shall pass and we will resume the uptrend that began on March 2009, but first we have to scare everyone to death. 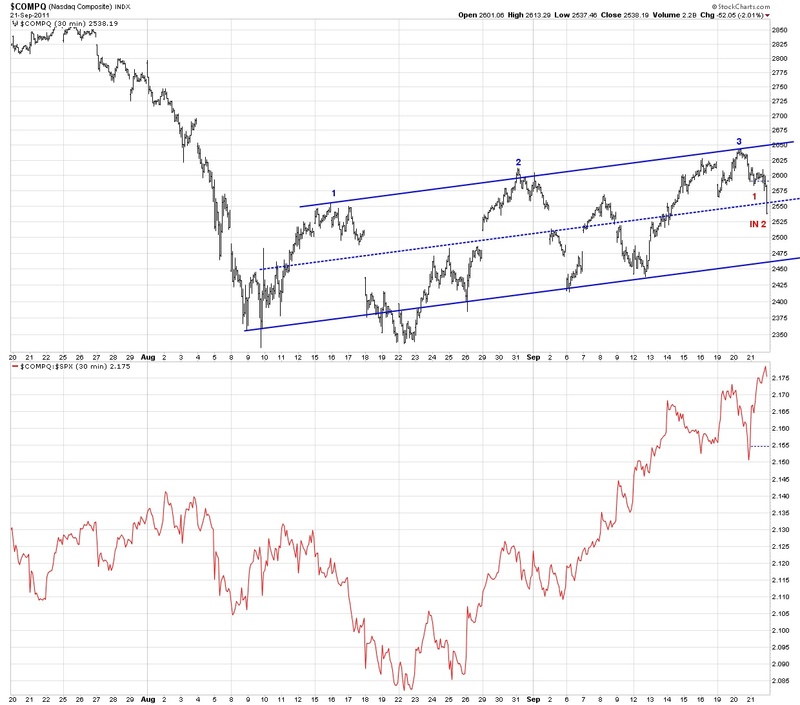 The next target to watch is the neckline on the Dow Industrials (see chart below). The measurement on the present head and shoulders formation is almost 1,000 Dow points. A break of the neckline would indicate 9,900 on the Dow. A head and shoulders formation after a top is considered to be a continuation pattern of the ongoing trend. To be valid we must break the neckline with a significant move. It’s not unusual to break the neckline and then have a return rally back to the neckline and then fall away. A return didn’t take place with the reversal head and shoulders formation in late July. We have completed a 3 step up and will now undergo a 3 step decline. It appears that we have completed a small step 1 down and if this is more bottoming action consistent with the August 9th low, we will probably stop in the same area of that bottom. But, if this is a major thrust downward, the neckline will break and we should lose in the area of another 1,000 Dow points, stopping around 9,900 Dow Industrials. We are watching closely the charts of the Nasdaq Composite and the semiconductor index. These may show an early indication of an impending market reversal. But for now we are watching for a break of support levels indicating lower prices in the near future. This entry was posted on September 21, 2011 at 5:29 PM and is filed under UPDATE. You can subscribe via RSS 2.0 feed to this post's comments. You can comment below, or link to this permanent URL from your own site.